Team 1 check their results with the judges. 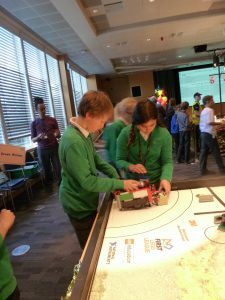 On Wednesday 11th January our team of Year 6 children travelled to the Hewlett Packard building in Bristol to compete in this year’s First Lego League Challenge. It was a long day, leaving in the dark and returning in the dark, but a very enjoyable one. writing and investigating information for their presentation. The second team watch their robot carry out the first procedure. This year’s theme was ‘Animal Allies’. Children all over the world have been taking part in the same challenges. 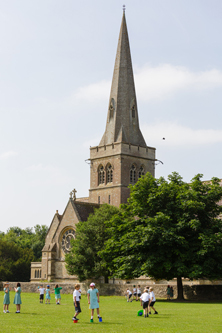 The regional tournament involved 23 teams but last year over 28,000 teams took part internationally. The six children first worked together to present their innovative idea of a transmission collar to save red wolves from poaching. 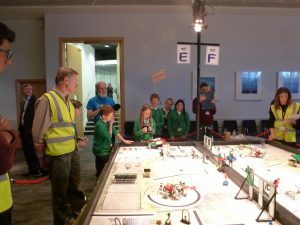 They next worked in pairs to carry out their robot procedures and also had to endure tough questions from a team of four judges on the robot design. Our last pair practising the robot run. The day was full. There was no time to sit and eat lunch, instead grabbing a quick bite of a sandwich between presentations and interviews. The atmosphere was a mixture of tension and excitement; full of apprehension and relief as the robot ran its course, and dancing and celebrating as the contestants paraded their balloon animal creations. A huge well done to our team for displaying resilience, determination and true Sutton Veny spirit throughout a challenging day.